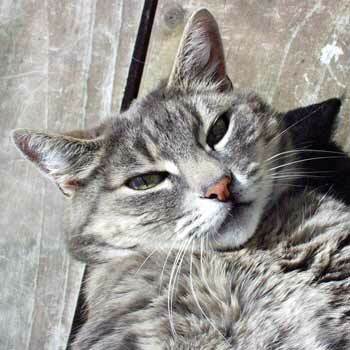 Stumpy is a small grey female tabby cat, one of two sisters. She is named after the middle stump-camera at the cricket, which one TV commentator affectionately called 'stumpy'. Cricket camera Stumpy was annihilated by a Pakistani fast bowler on the day that the new grey kittens came to live with us, and somehow the name seemed to suit. Stumpy as a kitten showed no fear, either of the resident dog Taj or of the other larger cats. She raced around the house, knocking over ornaments, climbing up curtains and hiding under chairs. She always peeped out from her hiding place with ears laid flat - a sure sign that she understood the rules of cat hunting. Stumpy the cat has grown up into a very wriggly, hyperactive cat. She still jumps up on benches and knocks objects off in the process. Vases of summer roses are never safe when Stumpy is about. She is always 'in your face', or on your lap, or sitting on the bench trying to get attention. Any visitors to the house who sit down are claimed within seconds. Their laps are always preferred to those of the residents. Stumpy is everyone's friend. Stumpy is fond of the twilight cat-walks that are a feature of the summers here. She won't come over the bridges that span the water race, though, and waits patiently to rejoin the walkers. She is moderately good cat company for the gardener, but is easily distracted. Given the chance she'd rather be back inside the house, on kitchen duty. The dried food is kept out of cat reach, but the pantry is easily raided. Someone usually walks past the bench to make a cup of tea, and possibly can be persuaded. When you're not in the mood Stumpy can be a total nuisance cat. She likes to be close, trying to claw her way up inside jerseys and jackets. She holds no grudges, either, and keeps coming back. 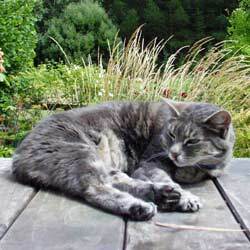 Here is Stumpy snoozing on the wobbly table on the patio, with driveway foliage and grass plumes in the background. This table is one of Stumpy's favourite spots. It's sunny for most of the day, and is also a good vantage point from which to keep track of the dog. Stumpy stretches out a sneaky paw and swipes the dog's nose when he gets too close. In the late afternoons of summer there may be other cats up here as well, enjoying the quiet time before the evening meal, in an uneasy truce. 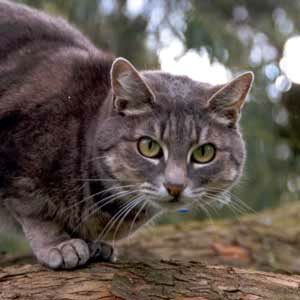 Of all our cats Stumpy can be the meanest to the dog, who is a very poor judge of cat character and often has the scratches to prove this. She will pretend to ignore him until he comes in for a close sniff, then she'll attack and howl her menacing battle cry. Victim dog slinks away, defeated again. Poor Taj-dog - he never learns. Stumpy passed away peacefully at home in the summer of December, 2008. Her memorial tree in the Hazelnut Orchard is a weeping Silver Pear - to fit with her silver greyness!